Whether you chose a cruise without a crew or the total luxury of an all-inclusive cruise, the first activity will always be (or almost) sailing on the spectacular waters of the Bahamas. Whether you prefer to let the wind coast, you away or choose plying and work to windward until destination, your participation in the maneuvers will take you as far as you want to go. And the beauty of the Bahamas? You always have the possibility to navigate in the lee of the islands, protected from the waves in the calm sea by the sandbank. Once in the paradise of Exumas, you can simply abandon yourself to the pleasures of the farniente in one the 1000 anchorages surrounded by the beaches of white sand that you will come across. So many opportunities to jump in the water, dive in a good book, visit rainbow coloured coral heads, or treat yourself to a dreamy siesta as you gently rock at the sound of the choppy sea. Many islands also offer hiking trails that will guide you to secret beaches, bottomless blue-holes, aircraft and boat wrecks, maritime geysers or caves on land and in the sea. The rich fauna of the Bahamas will invite you to all sorts of memorable encounters: prehistoric iguanas, giant rays, monumental crawfish, crabs, dolphins, sharks (nice ones), marine turtles and even ... swimming pigs! 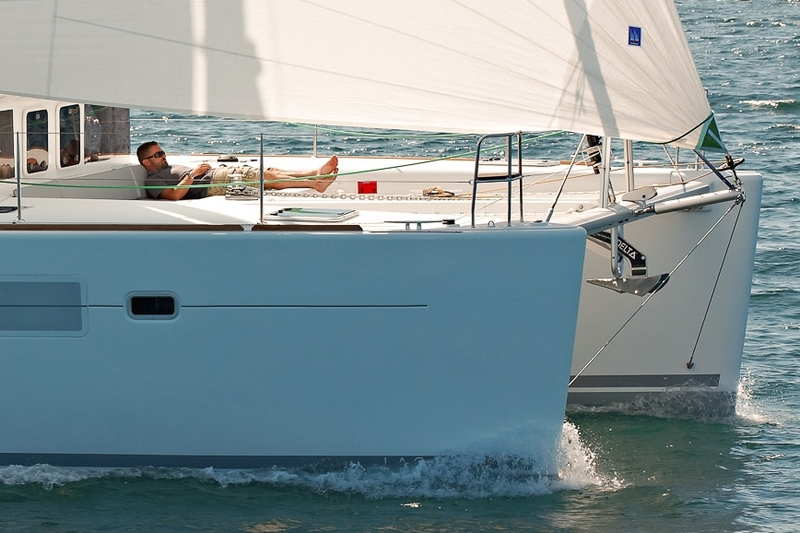 All the Navtours sailboats are equipped with snorkeling gear, an inflatable annex with rigid bottom of 3 meters and more and an outboard motor of 15 hp minimum. That's all you'll need to take full advantage of the Bahamas. In addition to snorkeling, Navtours offers a variety of water equipment to lease, like double and single kayaks, or the very popular paddle boards which are perfect for a visit in the mangroves' shallow water areas and the sand banks emerging at low tide. The Bahamas are also known as a top destination for fishing enthusiasts. You can catch just about all year long: tuna, mahi-mahi, wahoo, grouper, snapper, mackerel, crawfish and crab. Just get your fishing rod ready, throw the line in the water and today's menu will become a unique gourmet experience. If you don't have your fishing equipment, you can lease from Navtours everything you need to transform your cruise into a “miraculous fishing expedition”. Note that all of Navtours's boats have fishing license from the Bahamas and valid all year long. Navtours also offers many packages of thematic and specialized sailing allowing you to customize your stay in the Bahamas. 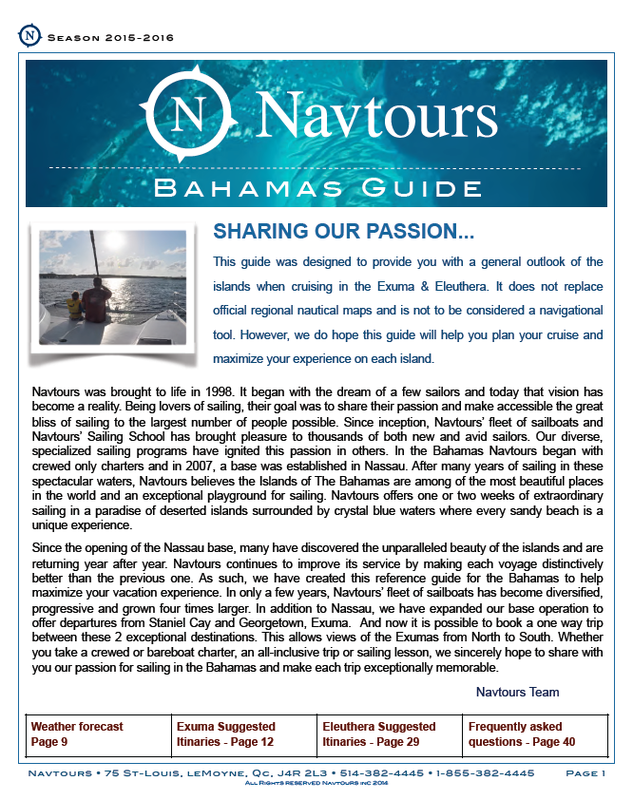 To learn more about navigation in the Bahamas, download our guide. You will find a wealth of information about the islands not to be missed and the activities you can practice.